We’re pleased to introduce our brand new Smart Inbox, reimagined to make it easier for you to effortlessly manage your social messages — no matter the size of your team. The new Smart Inbox is built around two concepts. First, visibility into your message volume and activity enables you to more effectively and efficiently communicate with your customers. Second, you need tools that enable you to not only be more effective and organized today, but that are flexible enough to support your social strategy as it evolves. 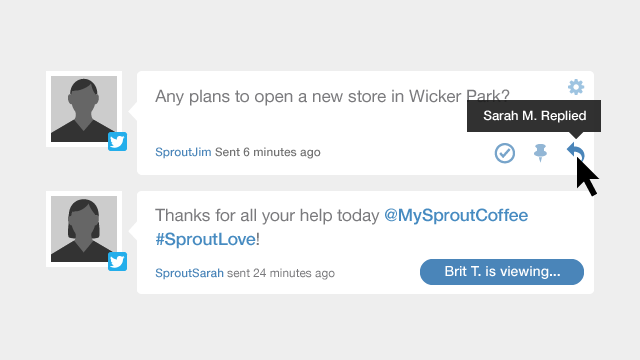 Now, you can tell Sprout you’ve dealt with a message by marking it complete. Replied to a message? It’s automatically marked as complete. Need information from someone in another department? Assign a task and the message will be marked as complete. See a message that doesn’t require any action on your part? Just click complete and move on to the next! By marking messages as complete, you and your team can easily stay focused on the ones that you still have to get to—resulting in fewer missed conversations and opportunities. The ability to mark as complete is controlled by a new manage message status permission; simply designate specific people on your team who can mark and view completed messages. You can set these permissions under Users & Social Profiles. Once messages are marked as complete, users on your team that have been granted the permission can remove them from their view by checking ‘Hide Completed Items.’ If your team likes to divvy up the workload, marking as complete and hiding messages from the inbox will ensure smarter collaboration. For teams spread out over multiple time zones, these new inbox features allow for seamless transitions as one team hands off to another. Or, if you just want to make sure you always know exactly where you left off each time you log in to Sprout, mark as complete will help you focus on the messages that you haven’t gotten to yet. The inbox chart shows you a visualization and count of inbox items by week, day or hour, right next to the message stream. In addition, users who are able to mark messages as complete will also see a visualization and count of the messages that have been completed—allowing them to compare real-time volume of incoming messages with those that are complete and providing a sense of exactly how many messages they have yet to address. Quickly filter by date range, profile, message type, and brand keyword. See a peak (or valley) in message volume on the inbox chart? Jump in to view activity and work on messages from specific weeks or days. We’ve also significantly improved collaboration features in the new inbox. Live activity updates now appear right inside the message stream – you no longer need to hit reply on a message to see if anyone else is working with it. You can also clearly track who replied to, tasked, or completed a message. The new Smart Inbox was carefully crafted to help you streamline your social inbox management. With a clear view of the entire social conversation and your inbox activity, you and your team will be able to work through your social messages and communicate with your customers much more efficiently and effectively.